Settings for the module that sends email from Hexamail Guard to your mail server. Hexamail Guard allows for flexible email routing through your system. If you are processing incoming email with Hexamail Guard you simply have to setup Hexamail Guard to forward/send email to your existing email server. Configure the Existing email server with the hostname/IP address and port of your existing email server. If the service is running as a System service (default) you need to specify a login password for the username that has access to Active Directory. This login is typically the one you use to logon to the Active Directory machine as adminsitrator. This password is sent and stored using strong encryption by the service. Use this button to force the modification of the Exchange settings. In addition, Exchange settings are updated every time Hexamail is reconfigured. Enter your existing mail server host name or IP Address and port (usually 25) into the appropriate boxes. 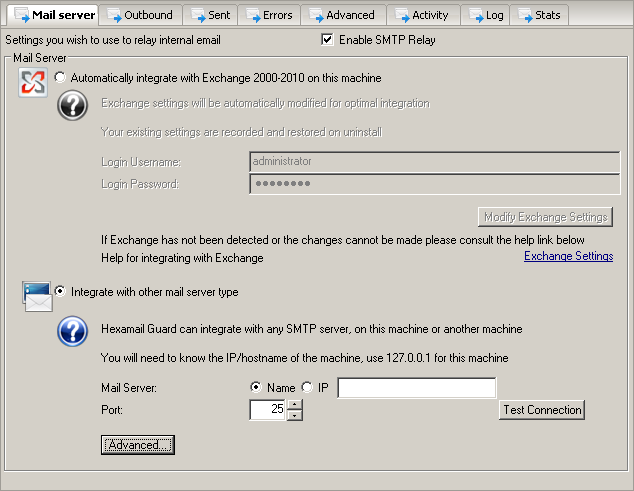 Use the Test Connection button to get the application to make a test connection to your mail server, verifying that the mail server is accessible to Hexamail and that the configuration is correct. Use SSL/TLS or STARTTLS to encrypt if when the server supports it. SSL/TLS is an encrypted connection to the server usually on port 587 or 465. STARTTLS connects unencrypted and then triggers an encrypted session using the STARTTLS command. This is usually on port 25 or 587. Use the STARTTLS setting to ensure STARTTLS is used IF the remote server advertises STARTTLS support. If set to STARTTLS Required then the email will be failed for recipient(s) on the server(s) that do not advertise/support STARTTLS in their greeting response to the SMTP EHLO command. Press the Advanced button to open the advanced mailserver settings.